R = Ultimate resistance offered by the soil. 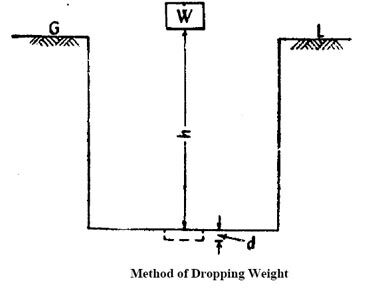 d = Depth of impression made by the falling weight. A = Cross-sectional area of the falling weight coming in contact with the soil. W = Weight of the falling weight. Energy lost in penetration is equal to the potential energy of the falling weight. This method of evaluating the safe bearing capacity of the soil is an approximate method, and hence should be used in case of minor structures only or where the method of slowly applying load is impracticable.